CSCS Operatives Test - What Should you Revise? Home / CSCS Revision / Operatives Test – What Should you Revise? The CITB Health, safety and environment test was created to help raise the standard across the construction industry. It helps workers meet a base level of health, safety and environmental awareness before they start work on site. This should be used as a stepping stone pushing employers and their employees to go further and develop their knowledge. 1.1 How is the test structured? 1.2 Whats is the CSCS test pass mark? 1.3 What is a behavioural case study question? 1.4 What is a knowledge question? 1.4.1 Who writes the questions? 1.5 Will the questions change? 1.5.1 How can I increase my chances of success? 1.5.2 What’s on the DVD, app and download? To pass your Health, safety and environment test you need to demonstrate knowledge and understanding across a number of areas, all of which are relevant to people working in a construction environment. There is not a minimum pass mark but sectional scoring, with minimum scores allocated to each section. This test structure has been designed to enable you to demonstrate knowledge across all of these key areas. The knowledge questions are grouped in chapters and sections, following the same structure that is used in all core CITB publications. General responsibilities: what you and your employer need to do to ensure everyone is working safely on site. Accident reporting and recording: when, how and why accidents need to be reported and recoreded. Health and welfare: common health issues on site and how to avoid them. Providing welfare facilities and support of site. First aid and emergency procedures: what you should do in case of an emergency, and what your employer must make available. Personal protective equipment: why personal protective equipment (PPE) is important, why you should wear it and who is responsible for it. Dust and fumes (respiratory hazards): how to work safely, protecting yourself and those around you from exposure to respiratory hazards. What health conditions may arise from exposure to dust and fumes. Noise and vibration: why it is important to minimise exposure to noise and vibration in the work place. How you should protect yourself and those around you. Hazardous substances: how you can identify a hazardous substance, and what control measures should be in place to enable you to work safely. Manual handling: why and how it is important to handle all loads using a safe system of work. What key areas you need to be aware of when handling loads. Safety signs: what type of safety signs you will see on a construction site, and what they are informing you of. Fire prevention and control: what you should do if you discover a fire, and which fire extinguishers should be used on what type of fire. Electrical safety, tools and equipment: how to work with different types of tools safely, and what you should do if the tools you are using have not been examined or are faulty. Site transport safety and lifting operations: how site vehicles and pedestrians should work together on site. Working at height: what types of equipment you will use working at height, and how to use them correctly. Excavations and confined spaces: why it is important, and how, to work safely in a confined space or excavation, and what you should do if exposed to certain hazards. Environmental awareness and waste control: your responsibilities on site, how waste should be managed and how to conserve energy. If you are preparing for a specialist test you will also be asked questions on your specialist activity. There are currently 12 specialist tests available including supervisory; demolition; highway works; specialist working at height; lifts and escalators; tunnelling; plumbing (JIB); heating, ventilation, air conditioning and refrigeration (heating and plumbing services; pipefitting and welding; ductwork; refrigeration and air conditioning; services and facilities maintenance). All tests last for 45 minutes and have 50 multiple-choice questions. There are two different types of question, behavioural case study questions and knowledge questions. 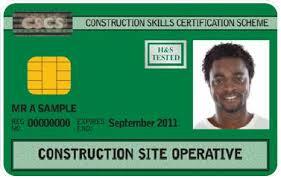 Whats is the CSCS test pass mark? To pass your CSCS test you will neeed to get a minium of 47 of of 50 questions answered corrected in the exam. What is a behavioural case study question? The behavioural case study questions are designed to test how you respond to health and safety situations on a construction site. Three case studies are included at the beginning of your test, each of which has four linked multiple-choice questions. The questions progress through a fictional situation faced by an individual working in the construction industry. They are based on the principles established in the film Setting out — what you should expect from a site and what they expect from you. What is a knowledge question? The knowledge questions cover 16 core areas that are included in all the tests. These questions are very factual. For example they will ask you to identify fire extinguishers and signs. There is an additional knowledge question bank for each specialist test. You will not need a detailed knowledge of the exact content or working of any regulations. However, you will need to show that you know what is required of you, the things you must do (or not do), and what to do in certain circumstances (for example, upon discovering an accident). Legislation in Northern Ireland and Scotland differs from that in the rest of the UK. For practical reasons, all candidates (including those in Northern Ireland and Scotland) will be tested on questions using legislation relevant to the remainder of the UK only. The question bank is developed by CITB with industry-recognised organisations which sit on or support the Health, safety and environment test question sub-committee. Health, safety and environment legislation, regulations and best practice will change from time to time, but CITB makes every effort to keep the test and the revision material up to date. You will not be tested on questions that are deemed to no longer be appropriate. You will be tested on knowledge questions presented in the most up to date edition of the CITB book. To revise effectively for the test you should use the latest edition. You can check which edition of the book you have at www.Citb.Co.uk/hsandetestupdate or phone 0344 994 4488. Prepare using the recommended revision materials, working through all the knowledge questions. Watch the Setting out film to prepare for the behavioural case study questions. Complete a recommended training course. Book your test when you are confident with your topics and questions. Complete a timed simulated test, which is available on the DVD, app and download. Take as many Mock Exams on this website as you can. What’s on the DVD, app and download? voice-overs in English and Welsh for all questions. Bulgarian , Czech, French, German, Hungarian, Lithuanian, Polish, Portuguese, Punjabi, Romanian, Russian, Spanish. Please note: British Sign Language assistance is included on the GT 100 revision DVD and within the Setting out film.